What do you do with dis-used land fill sites? You ride mountain bikes over them of course! What else! 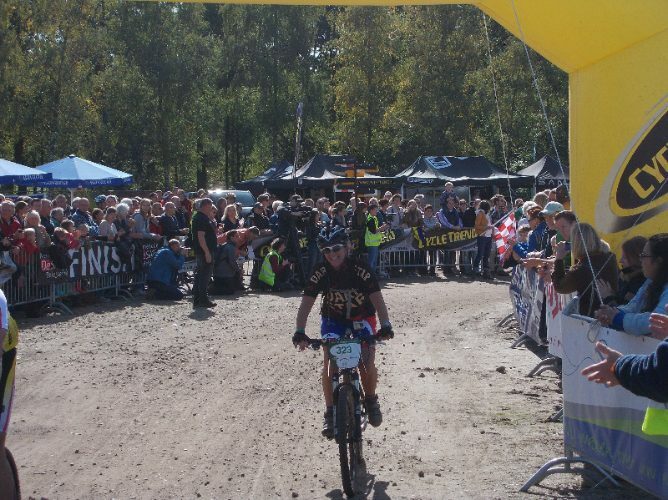 We had travelled to Nuenen, Holland for the Gulbergen24 MTB race. 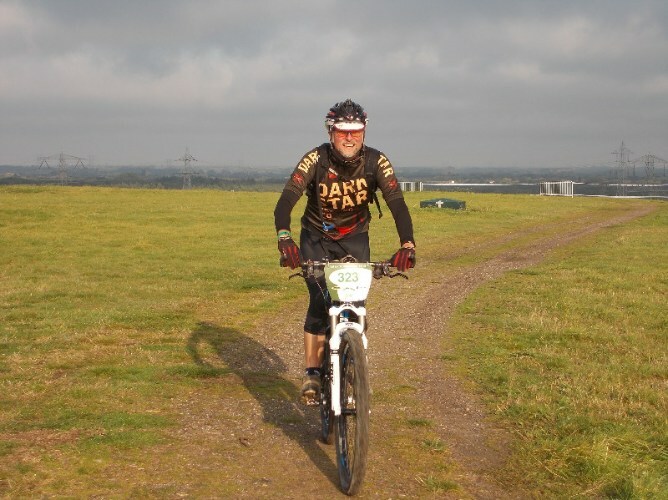 Roy had found the race during a search of the internet and, as the organisers had responded so positively to our questions, we had decided to enter. It also gave us the excuse to have a week’s holiday and by driving there, we could top up our beer stocks! 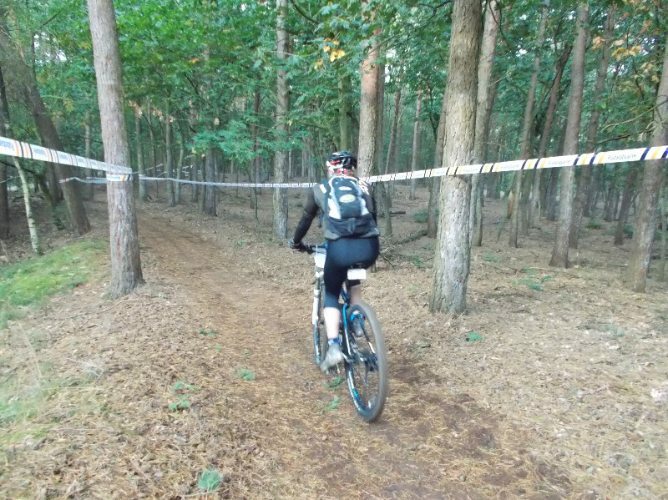 The assumption about mountain biking in the Netherlands is that everything is flat, but this is not the case for the Gulbergen24 race course. The course route takes the riders up an over ‘the mountain’ which is the aforementioned land fill site. 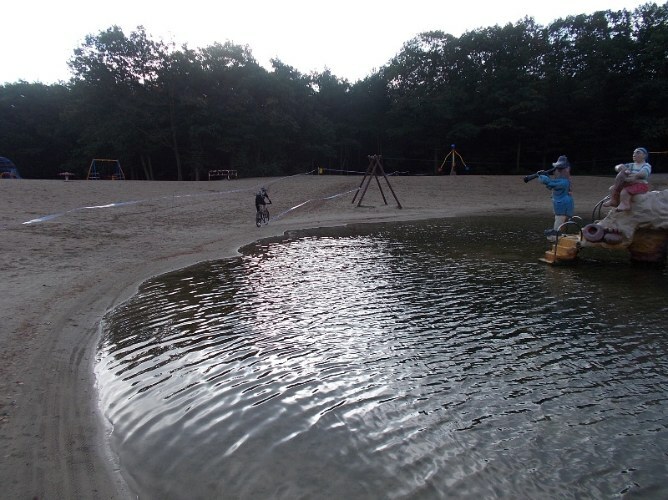 Beautification of the location has created a recreation area that provides a great view of nearby Eindhoven. However for the competitors, it provides a 150 feet climb on every lap of the race they complete. 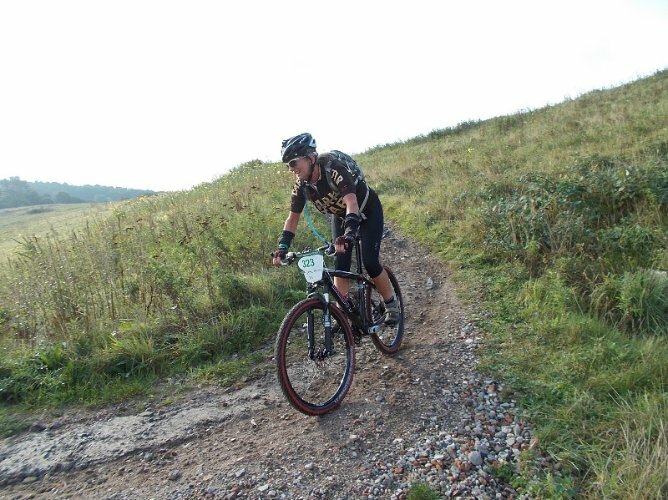 On the positive side – what goes up must come down and the descent off ‘the mountain’ is via a series of switchbacks, which got progressively rougher as the race went on. The race route then doubles back, through the back of the campground and into the woods via a temporary bridge that is erected for 4 days each year over the Eindhoven canal. The bridge is followed by about 1 mile of single track through the woods before the course pops out into the ‘t Wolfsven chalet park. A quick trip around the vans is followed by the spin around the lake and back into the woods. 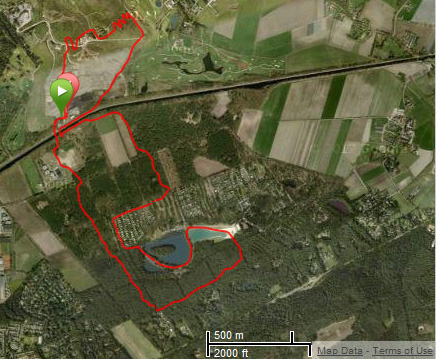 After just over another mile of wooded single track and the course crosses the canal again. A quick (ha ha) up and over another temporary bridge (which I only managed to climb a couple of times), and it was over the finish line and into transition. The only deviation to the course was put into place after dark when we were routed through the bar building. Yelling ‘God Save the Queen’ was greeted by loud cheers (they also have a Queen in the Netherlands). Having left home at 6.30am and with a 30 minute delay on the Eurotunnel, we rolled into the race venue just after 3pm. After signing on, we were shown to our campsite and immediately offered a beer by the neighbours. I had the feeling we would enjoy this place. The campground gradually filled and our tent was surrounded by all sorts of campers, caravans, converted vehicles of all shapes and sizes along with the usual array of Eeze-Ups. Our new Union flag banner flew high above everything. After an evening of speaking ‘pigeon English’, beers and a BBQ, we retired for the night. Man it got cold! Race day dawned partly cloudy; it looked as though the weather would be kind to us. We headed out for a practice lap and then it was porridge for breakfast. 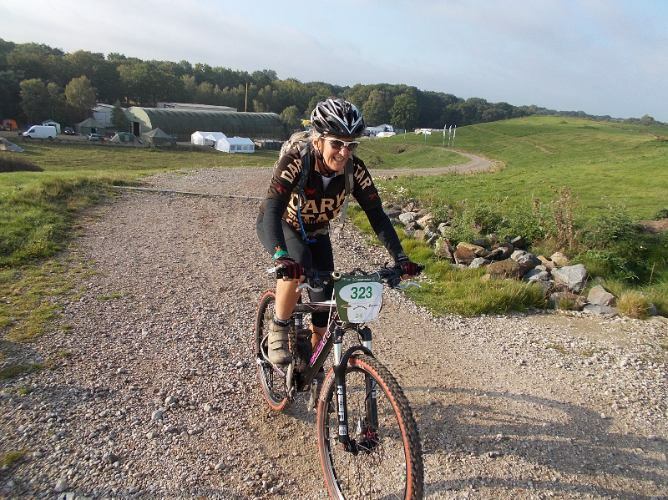 As my back had been giving me problems, I went hunting for a massage which I arranged for just after the start, which meant that Roy would have to start for Team Dark Star MTB. The rider’s briefing was interesting: 30 minutes in Dutch and 30 seconds in English!! All too soon it was 10 minutes to the start. 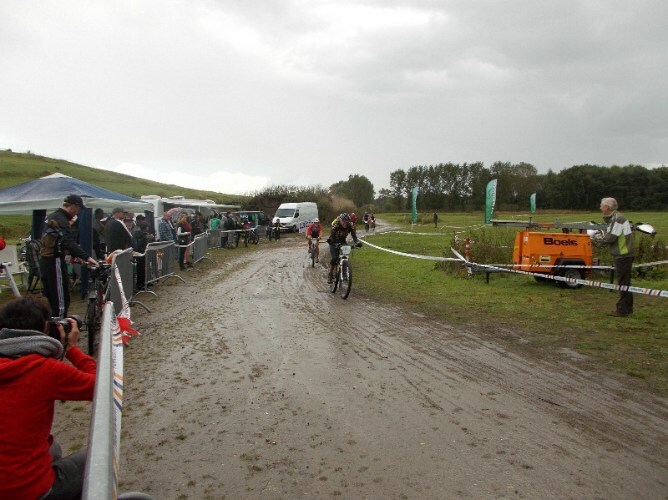 Riders were on the start line, grouped into 6 hour race followed by the 24 hour start. The countdown began. 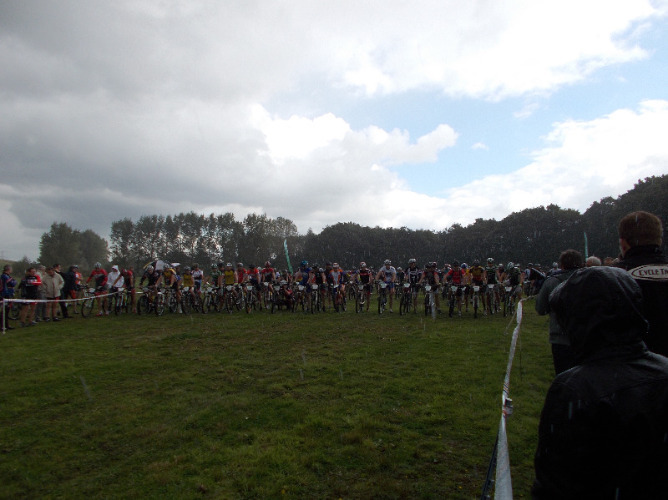 Just as the race started, the heavens opened – biblically! I was soaked in an instant as was everyone else, including Roy. Luckily the rain didn’t last long and didn’t occur again. I headed off for my massage, then I collected my bike. As reached the transition area, Roy was just heading through. We decided he would do a third lap before changing over. After our hand-over, I headed up the climb. Fresh legs meant it was my fastest climb. 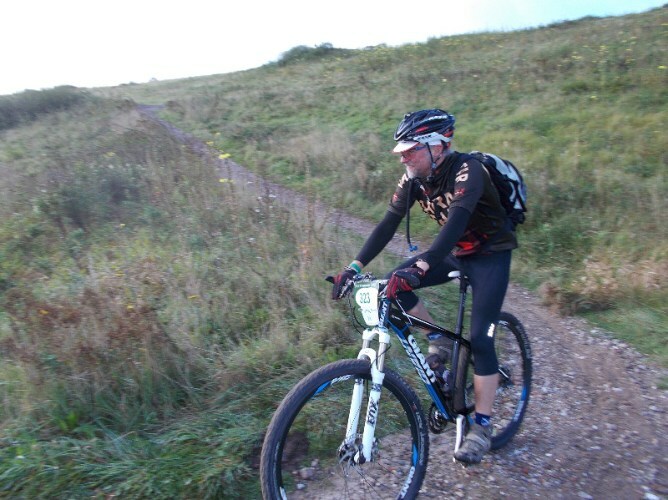 On each subsequent lap, the climb seemed to get steeper (and thus slower)! The descent through the switchbacks, become looser and more rutted as time progressed. I stopped on one lap after a young lad ‘endo’ed ahead of me. He was pretty shaken for a while but made it back to the campground. I had some good karma in the bank! The woods were really enjoyable but very like Thetford Forest. It would not be possible to have much of a recovery during the laps. Ah well – keep fuelling! I was really pleased with my first pair of laps and I handed the transponder back to Roy. I had a second massage – my back was much better now. As the race went on, I began to look forward to the 6 hour race being over as the lap would be quieter. I was struggling to cope with the silent approach of riders behind and ‘jumping’ as they went past. If I knew they were coming, I would tell them which side to pass. 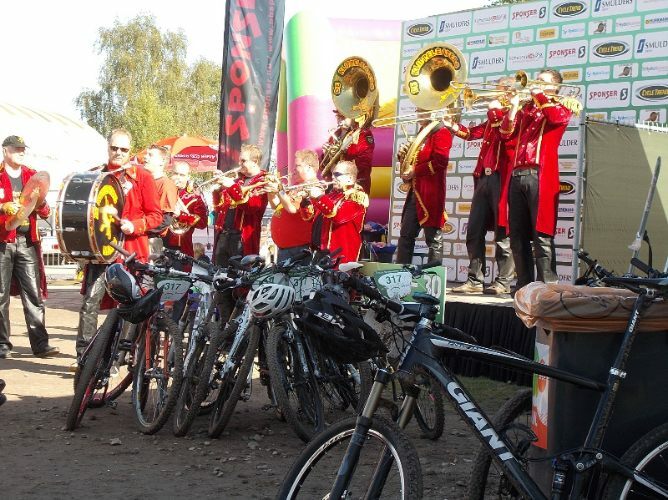 The Oompah band signalled the end of the 6 hour race, lights on and the 24 hour racers carried on. There was an amazing full moon that night, but that also meant that the temperature was plummeting. After 5 double laps, I was really struggling. I was getting cold and my pile of sweaty clothes was growing rapidly. It was nearly midnight and I was giving my all. A quick chat with Roy in transition and we decided that we would take a break. He completed another 2 laps while I got the tent ready for sleeping. Our small gas heater did a good job of heating the tent, but I was not happy to leave it on while we were asleep. I’m not sure how much sleep I got, but I was raring to go at 6am. As it was still dark, my lights were on and I really enjoyed my laps. If the first 11 hours had gone slowly, the final 7 hours flew past. All too soon, it was my last lap. I decided to fit the GoPro camera and record it for prosperity. There was a lot of lurking going on during that lap. 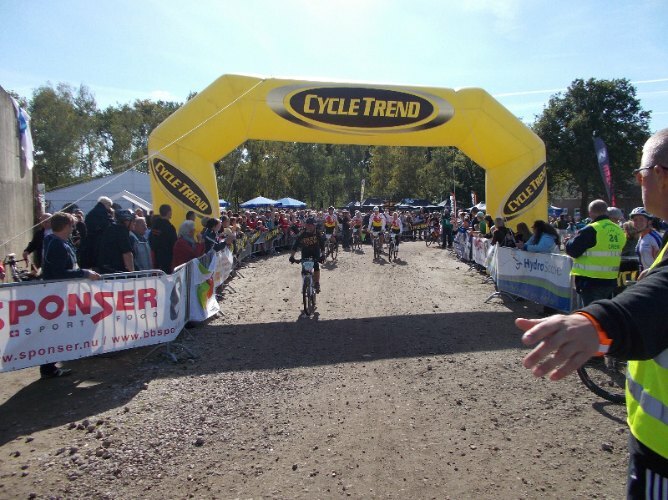 Teams were congregating to go en-mass across the line after the 1pm finish. It was amazing. There were loads of people cheering us over the finish – the only Brits at the event. This was an awesome event. The organisers and competitors made us feel so welcome and I can’t wait to return next year, fitter and stronger than ever. What made this event all the more special was getting on the podium. And finally, to whoever left the bottle of bubbly on the table next to our tent – THANKYOU!